Ernest G. Carroll, 5504 Chadwick road, Johnson County, Kansas, former sheriff at Olathe, Kas., died last night at the Providence hospital, Kansas City, Kansas. 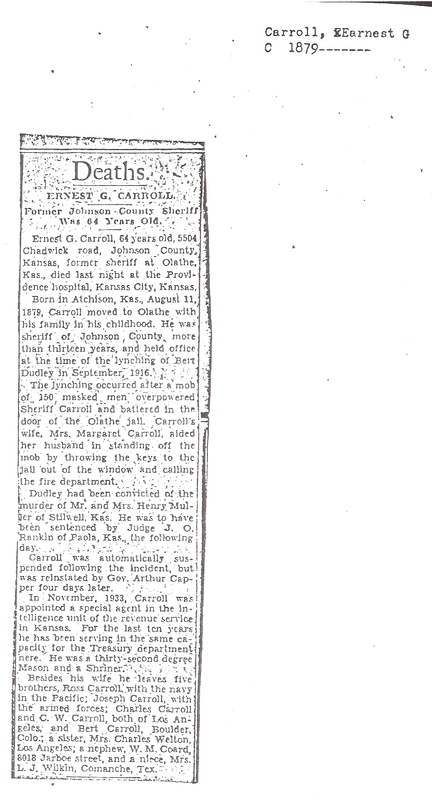 Born in Atchinson, Kas., August 11, 18790, Carroll moved to Olathe with his family in his childhood. He was sheriff of Johnson County more than thirteen years, and held office at the time of the lunching of Bert Dudley in September, 1916. The lynching occurred after a mob of 150 masked men overpowered Sheriff Carroll and battered in the door of the Olathe jail. Carroll’s wife, Mrs. Margaret Carroll, aided her husband in standing off the mob by throwing the keys to the jailhouse out of the window and calling the fire department. Dudley had been convicted of the murder of Mr. and Mrs. Henry Muller of Stillwell, Kas. He was to hve been sentenced by Judge J.O. Rankin of Paola, Kas. The following day. Carroll was automatically suspended following the incident, but was re-instated by Gov. Arthur Capper four days later. In November, 1933, Carroll was appointed a special agent in the intelligence unit of the revenue service in Kansas. For the last ten years he has been serving in the same capacity for the Treasury department here. He was a thirty-second degree Mason and a Shriner. Besides his wife he leaves his five brothers, Ross Carroll, with the navy in the Pacific; Joseph Carroll with the armed forces’ Charles Carroll and C.W. 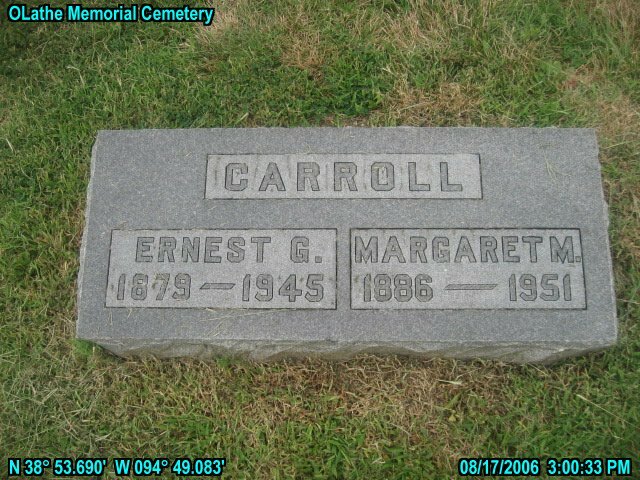 Carroll, both of Los Angeles, and Bert Carroll, Boulder, Colo; a sister, Mrs. Charles Wellton, Los Angeles; a nephew, W.M. Coard, 8018 Jarboe street, and a niece, Mrs. L.J. Wlkin, Comanche, Tex. Please share your memories of Ernest G..